Music magazine Billboard has quietly added Apple Music to the list of streaming services factored into its music charts, which are often treated as the main gauge of popular music in the United States. Apple Music data is now at play in the Billboard 200 album chart, as well as the Hot 100 singles list and various other rankings, the magazine said. 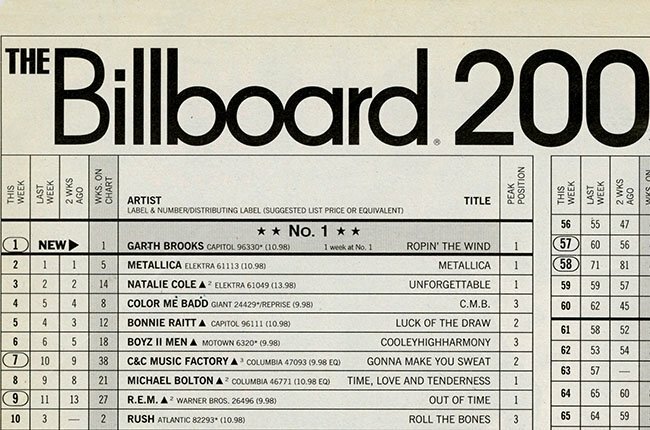 The Billboard 200 incorporates "track equivalent albums" and "streaming equivalent albums" alongside conventional sales numbers. Other streaming services influencing Billboard numbers include Amazon Prime, Google Play, Medianet, Rdio, Rhapsody, Slacker, Tidal, Spotify, Groove Music Pass (until recently Xbox Music), and the soon-to-be-defunct Beats Music. Apple is no longer taking new Beats Music subscribers, and is actively working to migrate them over to Apple Music. The addition is symbolically important for Apple in establishing the legitimacy of its new service. Sales at the iTunes Store have long counted towards song and album charts, and indeed iTunes sales are often considered a major metric on their own, given Apple's dominance in the digital download market. That market has been declining in the past few years with the ascendancy of streaming options, whether on-demand services like Spotify or radio-only platforms like Pandora. Apple Music offers both approaches, though with a greater emphasis on the on-demand content.